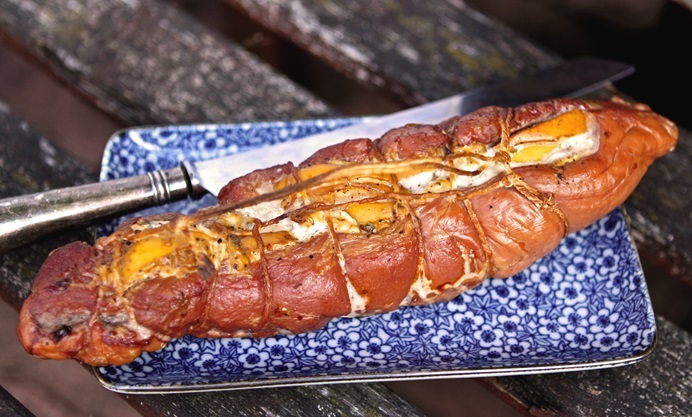 This fantastic barbecued stuffed pork fillet recipe delves deep into the art of the barbecue. 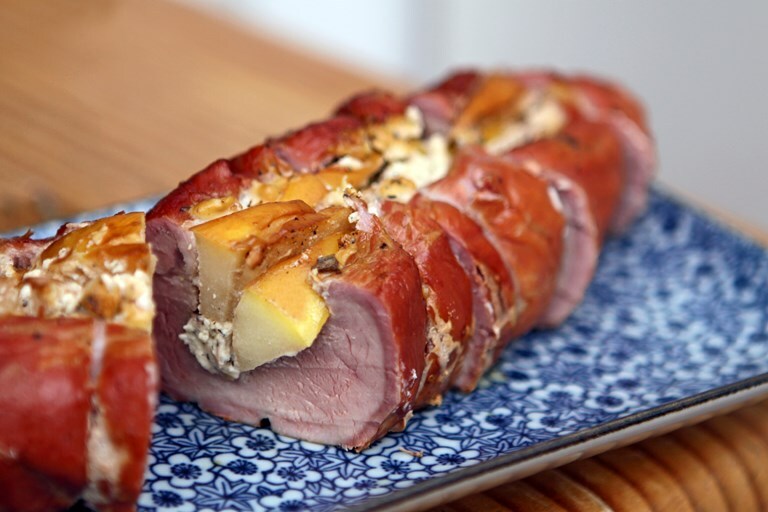 Jeanne offers us a comprehensive guide to setting up your grill for perfect results – this method works brilliantly with the soft cheese and apple-stuffed pork, which is drizzled with Cognac for an extra-punchy flavour. For the uninitiated, a braaivleis (literally 'grill meat') or braai is the South African version of the English barbecue. People often ask me what the difference is between a barbecue and a braai – or if there is even one! For me the differences are subtle but significant. Firstly, a braai is all about the over-catering. Unlike a barbecue where everyone brings just enough meat to feed themselves, at a braai, people bring enough food to see them through a nuclear apocalypse. If you aren’t still eating leftover meat a week later, you haven’t had a proper braai. Secondly, purists will tell you that a braai has to take place on a wood-fuelled fire – not the wussy charcoal briquettes of the barbecue – preferably wood that you chopped yourself with a Very Big Axe. Gas and disposable barbecues are too embarrassing to even discuss! And thirdly, there’s the question of what to braai. No self-respecting braai would countenance the addition of pork bangers or burger patties. Oh no, we are all about massive hunks of meat – the bigger the better! Although a pork tenderloin is not the most massive cut of meat, it is considerably more meaty than a pork banger and perfect for the braai. People seem to be nervous of barbecuing anything bigger than a burger patty but there’s no need to be – with the assistance of a kettle charcoal barbecue like a Weber (braai purists, avert your eyes!) and a little patience, it’s considerably easier than the faff of sausages that burn so easily. 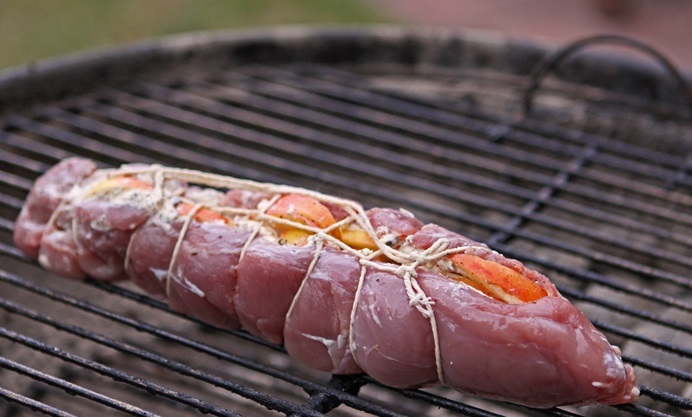 Here, I’ve stuffed my tenderloin with sweet red apples, peppery Boursin cheese, a sprinkle of sage and a drizzle of Cognac. What could be simpler – or more delicious? The pork is cooked on an indirect fire in a kettle barbecue. This method of barbecuing is pioneered by Weber and is discussed in most cookbooks featuring Weber recipes, but in case you don’t possess such a book, here’s how. Make a fire using sixteen charcoal briquettes and light them all in a pile on one side of the barbecue kettle. Once the briquettes have had time to ash over (about 40 minutes), transfer half of them to the other side of the barbecue. Position a foil drip tray between the two piles to keep them apart. Place the grill on the barbecue and voila, you are ready to cook.